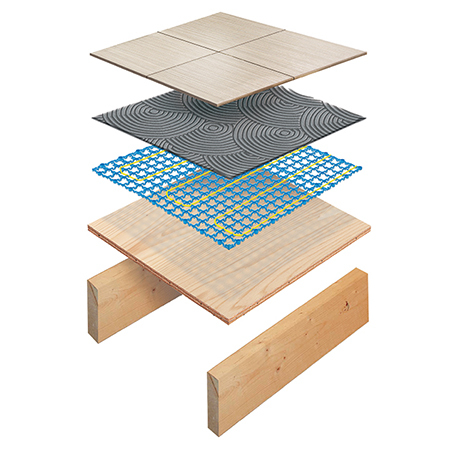 Thermogroup have launched a new product: Vario PLY, a unique reinforcing mesh and underfloor heating system which has been designed for installation over timber substrates. Not only is Vario PLY thinner than ply it is also stronger and more durable. Add the comfort of electric underfloor heating and the result is the most effective and professional solution for tiling over timber substrates. Vario PLY is designed to hold Vario PRO heating cables at variable spacing depending on output. Create a thinner floor buildup by removing the need for 18mm plywood over timber floor boards. Simply install Vario PLY and tile over the top. The mesh grid reinforces the tile adhesive layer of your floor, resulting in a layer that is stronger and thinner than 18mm ply. Vario PLY mesh panels are clipped together and fitted to timber floors with wood screws. You can fill with a levelling compound and tile over. Removing the need for additional plywood in first floor rooms with timber substrates means you don't need a stepped threshold for underfloor heating.